As technology advances, electronic waste, or e-waste, accumulates just as quickly. From old television sets to last year’s flagship cell phones, 20 to 50 million metric tons of e-waste are disposed of annually world-wide. To keep their potentially dangerous components from hurting the environment, proper disposal of electronics is important. Want to get rid of your old stuff responsibly? We’re here to help. Learn how to dispose of electronics the right way with our complete e-waste disposal guide. Can You Throw Electronics in a Dumpster? You can dispose of old electronics in a dumpster in most cases. Renting a dumpster is an easy way to get rid of everything at once when cleaning out a home or place of business. Keep in mind that local regulations may prohibit or limit electronics disposal in some areas due to landfill restrictions. In other locations, an additional fee may apply to cover safe handling. To find out if electronics are accepted in your area, give us a call. Whether you’re upgrading to the latest high definition model or you’re finally tossing that old-school furniture-sized set, throwing away your old tv can be tricky sometimes. Old television sets can contain approximately 4-8 pounds of lead. If disposed of improperly, this toxic substance can leach into the ground, contaminating groundwater. Luckily, there are plenty of options for tossing your old TV. 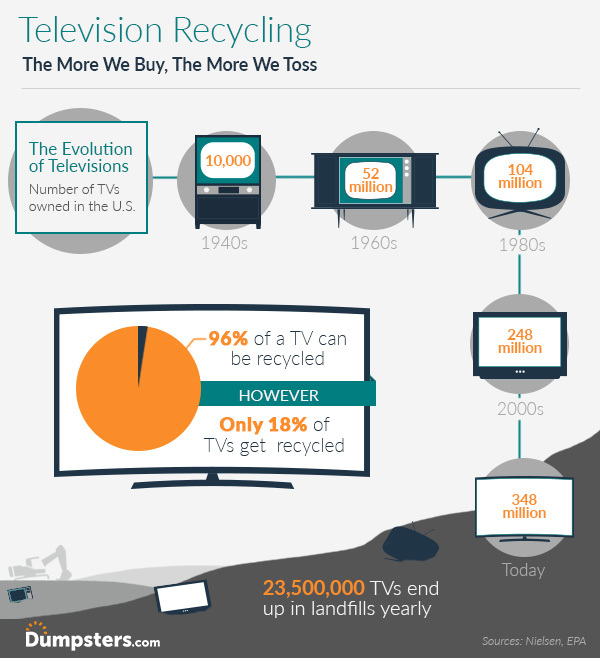 From selling to recycling, learn how to get rid of your old TV sets with the information below. Can I Donate My Television? If your TV still works, you can donate it to save it from the landfill. Not only will you help a family in need, but you can often get tax write-offs for charitable donations. When considering donation, always make sure that it still works first. If your television is in good condition, contact local charities or donation centers to see if they are currently accepting electronics. (You can also check if any friends or relatives need a new set. The following organizations generally accept television donations. Some will even pick up your electronics for you. Please note that many charities only accept flat-screen televisions. Older tube-style TVs are in less demand and can be costly for them to recycle. If you can’t donate your old television, the most environmentally friendly disposal option is often to recycle it. Some electronics recycling centers even offer cash for the precious metals they contain. You can use online resources like Earth911 or RecyclerFinder.com to find a recycling center near you. If you can’t find a location in your area, many electronics companies have voluntary takeback programs. Some will even pick up your electronics for you. You can use this list provided by the Electronics TakeBack Coalition for more information. When purchasing your new television, you can also ask the store if they offer recycling. The following brands offer in-store collection, pickup services and even mail-in recycling options depending on your area. Where Can I Sell My Television? Provide specific details like age, make and model. Be honest about any scratches or mechanical issues. Curbside Trash Pickup. Some cities provide curbside collection services for large electronics like televisions. Just keep in mind that some trash collection companies charge extra fees to pick up e-waste with your regular trash. You might also need to wait for your city’s next bulk collection day. Dumpster Rental. If you’re getting rid of your television as part of a larger home or business cleanout, you can have a roll off dumpster delivered to your driveway for easy electronic waste removal. This is often the easiest way to clean out a home or place of business. Keep in mind that some cities charge extra fees for handling electronics. Note that rental costs may also vary by location and weight restrictions apply. Junk Removal Services. You can also hire a junk removal service to haul your old television set and other clutter away. However, most junk removal companies charge you by the amount of space your items take up in their truck. So, depending on how much you have to get rid of, a dumpster rental, with a flat rate may be more cost-effective. Is a dumpster rental the right television disposal option for you? Call 844-444-DUMP to get rid of your old household items today! Whether your current machine no longer works or you’re simply upgrading to a newer model, disposing of your old computers is usually an afterthought. Fortunately, there are plenty of options for computer equipment disposal, from renting a dumpster to refurbishing it for reuse. Find out what to do with old computer monitors and equipment with the tips below. Pro Tip: Make sure to back up your data and delete all personal information from the hard drive before disposing of old computers. If you plan to donate or sell your old computer, always run a security scan for malware – including viruses, spyware and worms. Can I Donate My Old Computer? Yes, if your computer is still in good shape and virus-free, you can contact local charities, schools or donation centers. Homeowners and businesses often upgrade their computer equipment even though their older models still work, and some non-profits would be happy to have them. 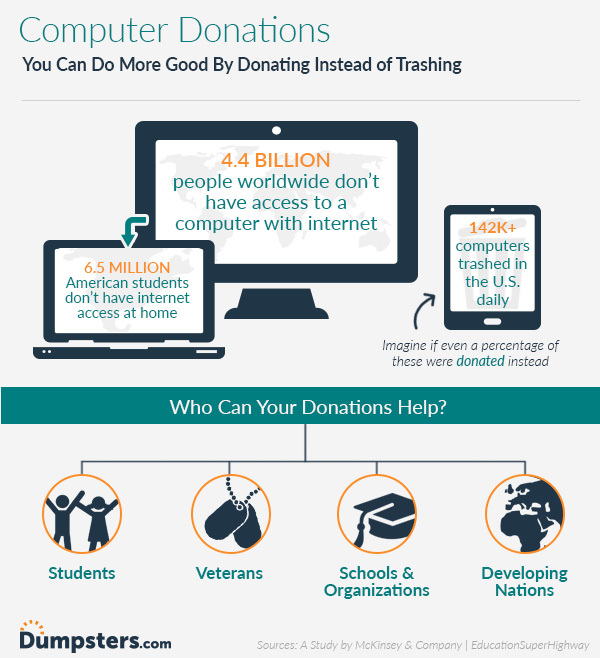 Some will even pick up your old electronics for you and with many programs your donation can even be tax-deductible. Can I Sell My Old Computer? Keep in Mind: Before disposing of old laptop computers, always remove any batteries. They are considered hazardous waste and need to be recycled separately. Can I Recycle My Computer Equipment? Can I Throw My Old Computer in A Dumpster? Curbside Trash Pickup. Your city might provide curbside collection services for electronic waste. However, you’ll likely need to wait for your local bulk collection day, which can be inconvenient. You might also consider taking these items to your local hazardous waste facility. Check with your trash collection company for details. Junk Removal Services. You can hire a junk collection company to take your old electronics. This option can be a good choice for schools or businesses looking to dispose of a large number of old computers but may not be worth the expense for personal computer disposal. If you need to dispose of an old printer along with your computer, you can often follow similar steps to those above. From recycling to donation, there are also plenty of environmentally friendly options for getting rid of an old printer. To donate your old printer, you can contact schools, recreation centers, charities and nonprofits in your area. Also, organizations like the World Computer Exchange provide computer equipment to developing countries. To recycle your old printer, start by calling the printer’s manufacturer. Epson, Canon, HP, Sony and Samsung offer e-waste recycling and take-back programs. To sell your old printer, try online marketplaces like eBay or Craigslist. You might also consider a service like Sell Your Printers that specializes in refurbishing printers. Do you need to rent a dumpster to toss your old electronics? Call 844-444-DUMP to find the best disposal option near you. While most of us love upgrading to the latest model smartphone, many components in your old device are pretty valuable. According to the EPA, for every million cell phones we recycle, 35 thousand pounds of copper, 772 pounds of silver, 75 pounds of gold and 33 pounds of palladium can be recovered. The EPA also estimates that more than 152 million mobile phones were disposed of in 2010, which translates to approximately 350,000 phones per day. Find out how to dispose of your old cell phones and chargers properly with the tips below. Pro Tip: Always back up your data and delete all personal information from your device before trying any of the following cell phone disposal options. In many cases, you will also need to remove your cell phone battery before recycling or disposal. Can I Donate My Cell Phone? Where Can I Sell My Old Smartphone? Can Cell Phones Be Recycled? If your cell phone is past its prime, recycling is the most ecofriendly option. Various components of your old cell phone can be used to refurbish other phones for reuse. Some recycling centers even offer cash for your old electronics. Retailers like Staples and Best Buy take back many cell phones and other electronics for free recycling. Contact the store nearest you for more information. You can also use online resources like Earth911, Call2Recycle or RecyclerFinder.com to find an electronics recycling center near you. Keep in Mind: Before getting rid of your old electronics, always remove any batteries. They are considered hazardous waste and need to be recycled separately. Send the battery to your local electronic waste center or contact your city’s household hazardous waste facility. Take the battery to an electronic repair store such as Apple or Best Buy. They can often safely dispose of your old cell phone battery for you. If your battery is punctured or swollen, do not attempt to charge it and do not toss it with your regular trash or anywhere else. Punctured or swollen batteries can explode and cause fire hazards. Swollen batteries are not safe to drop off at electronics recycling centers. Instead, place them in a cool container and take them to an authorized battery disposal center. Inform the staff that you’re dropping off a swollen or punctured battery so they can take the necessary precautions. Can I Throw My Old Cell Phone in a Dumpster? Curbside Trash Pickup. Some cities provide curbside collection services for large amounts of e-waste. However, some areas charge extra fees and may require you to wait for your neighborhood’s bulk collection day. You can usually take smaller electronics like cell phones to your local e-waste collection facility. Check with your trash collection company. Dumpster Rental. You can have a roll off dumpster delivered to your driveway for fast electronics disposal. This is often the easiest way to get rid of a large amount of e-waste, along with other household items. Keep in mind that some cities place restrictions on e-waste disposal and may charge extra fees. Note that rental costs vary by location and weight restrictions apply. Junk Removal Services. You can also hire a junk removal service to haul your electronic waste away for you. But remember that most junk removal companies charge you by the amount of space your items take up in their truck. With a dumpster rental, you typically pay one flat rate as long as you stay within the weight limit. Is a dumpster rental the right e-waste disposal option for you? Call 844-444-DUMP to get rid of your old electronics today! At Dumpsters.com, our goal is to make handling electronics waste disposal as easy as possible. From old computers and printers to cell phones and batteries, we know that getting rid of electronics properly can be tough. Our Electronics Disposal Guide was designed to help you find the most environmentally friendly option for your old gadgets and gizmos. To find out how to dispose of other tricky items, check out our disposal guides for furniture, appliances and more. If you have questions or need a dumpster to clean out your home or office, give us a call at 1-844-444-DUMP.